It has been a long time since I last corresponded on a forum with you, AND I so appreciate your knowledge and the forum you have constructed here for the more in depth understanding of Jung and what lies beneath us in our unconscious/collective unconscious worlds. With that said, I wanted to restate the importance of the 'timelessness' otherworldly connection to the subtle body in dreams, etc. I have, since 1972, communicated often in my dream state and meditative state with Jung, even before I knew who he was. He basically corrects my endeavours and causes me to read something he wrote in whatever I am studying at the time. I have learned that through the last 30 plus years, how to notice when he has intervened into my thought patterns and given me clues as to what exists for me to research. I know that I have spoken with others who also see him in their dreams and connections. Since I am a therapist and an astrologer/alchemist, I am drawn to understanding in numerological and astrological symbols when something needs to be adjusted....by him especially....I hope I am being clear with my explanation, however, I think of this as a adventure into timelessness in which language is not rational but very irrational...and intuitive Again I appreciate all that you give to the community and your unique knowledge has helped me verify some important elements in my own alchemical understanding of life. Hi, Gwynne. Nice to have you here again. The funny thing is that C.G. Jung sometimes stands behind me - sometimes together with Wolfgang Pauli and Marie-Louise von Franz - and likes to learn from me. They all are intensely interested in my reserach. Thus, I think that it is a good thing that Pari Publishing will publish my book "Return of the World Soul" in Sept. 2011. I hope to get a copy....will it be sold through Amazon? I can certainly understand the avid interests that those three have in your movement toward the irrational/subtle body/world soul...etc....you are a forerunner in that part of the Jungian world. A large task you have taken on and I admire it greatly. My dreams lead me in your direction...and to the further work of Jung on 'the other side'. you are a forerunner in that part of the Jungian world. A large task you have taken on and I admire it greatly. My dreams lead me in your direction...and to the further work of Jung on 'the other side'. In fact, I have abandonned the Jungian world. This world is too Neoplatonic = Out of evil matter the good spirit must be liberated! The best example is Shamdasani with his completely fart-dry description of Jung and his work. My world is Hermetic, and I think with the description of this old/new world I have recovered my Jewish roots. In connection with my deam of Jung's incarnation, I would like now to enter a discussion about incubi, succubi, mediumism and channeling some in the forum touched upon, especially Suzanne, Kristin, Patrick and Jan.
First, I think that most of these mediums do have the problem that they did not analyse their personal shadow. Thus, everything is merged: complexes, archetypes, and "the people in the Beyond." Since they do not realize their personal shadow, they mix it up with the other "levels" of the "unconscious" or of the psychophysical reality (or unus mundus). As much as I see, incubi and succubi have much to do with this unconsciousness of the personal shadow. I was never interested in spiritism/mediumism. Then I read about Jung's séances with Helly, with his cousin Helene Preiswerk. I realized that he had touched something very real, since Helly did not have any reason to cheat. (Later Jung claimed that in the last sessions she cheated; I think, however, that if she did this, it was the effect of Jung's idea to invite his fellow students to the séances. Helly was an introverted feeling type, and was not able to be confronted with this situation). In other threads I showed that up until 1898, when Jung ended these sessions, he behaved in a completely Hermetic way. Then, with the beginning of his practical medical studies he began to be Neoplatonic, i.e., causal/materialistic (and when he later read Freud's Interpretation of Dreams and met him in person, became a causal-materialistic psychoanalyst). In his comment to the Red Book Shamdasani does not realize this early split in Carl Jung (and like this idealizes him). IMO, this split, or at least the ambivalence between Neoplatonism and Hermeticism is very important. If one has the eye for this (which means that one can distinguish between the Neoplatonic and Hermetic world view), it is visible in the whole work of Jung. And my dream seems to have to do with it. As we know, Carl G. Jung developed first the association experiment, and like this discovered and defined what he called the emotional complexes, the contents of the personal unconscious (or subconscious of Freud). Then, during his big crisis, the "night sea journey" from 1913 to 1918, he discovered the archetypes. And here the trouble begins: He had, especially also as a result of the experiences described in the Red Book (see also MDR), to accept that archetypes have what he called the "preconscious knowledge" (or "absolute knowledge"). They knew much more than his ego. However, such a preconscious knowledge is not explainable with a causal theory. This is so, since when one becomes conscious of the preconscious knowledge of the archetypes, a spontaneous extension of consciousness happens: In the act that I call the singular inner acausal quantum leap, the knowledge has become conscious and a real incarnation (in the realm of the spirit/mind) has happened. If we look at Jung's work, and especially at his definition of the archetype of the Self, we see that there is a very crucial contradiction: On the one hand, for example in AION, the archetype and its development during history is explained in a completely causal way. However, the preconscious knowledge and especially synchronicity – which is, according to Jung, especially experienced when an archetype is “constellated” and its content would like to become conscious – can only be explained in an acausal way. This is so since synchronicity is final or teleological; it talks of a specific goal one should reach. Teleology cannot however be explained causally; it is always acausal. As I showed further, Jung’s behaviour concerning synchroncities is a mixture of causality and acausality: For experiencing them, one has to enter (or falls unconsciously into) Eros consciousness. The Eros ego is on the one hand completely acausal (spontaneous), and on the other this way it can observe acausal events (spontaneous inner or inner-outer events; the “psychophysical quantum leaps” in my terminology). The interpretation of a synchronicity is a creation by cognition, and since all conscious cognition is causal, also the extraction of the meaning of a synchronicity is causal. Thus, Jung's behaviour re synchronicities is based on his unconscious mixture of Neoplatonic/causal and Hermetic/acausal phenomena. In connection with my deam of Jung's incarnation, I would like now to enter a discussion about incubi, succubi, mediumism and channeling some in the forum touched upon, especially Suzanne, Kristin, Patrick and Jan."
My favorite investigation as this condition has been with me since the age of three years old, beginning in my cognitive life....and continuing until the age of 33 at which time I went into several out of body experiences due to an horrific car accident....from that point on until today at the age of 69...I have trance-like conditions that others would call meditative, but actually take me to other worlds....within this world. I conduct many workshops on the 'shadow'; personal, collective and dream shadows and know that it takes a great deal of digging to get into these and find the way they drain the life force....becoming a sort of succubus. This puts together some very interesting connections between intuition, subtle body, etc....especially regarding 'eros consciousness...a real keeper! Gwynne (I ordered your book and hopefully will find some conversation there as well.) . - And Jung , are you in contact with him? I listened to music with headphones on. I fell asleep. At one point, I heard a voice say: "Abraxas is the master of Christians"
As you surely see, in the BCI/SST I fell unconsciously into the Eros consciousness. In this vegetative state I experienced the vegetative aspect of my body, the snake/Abraxas. 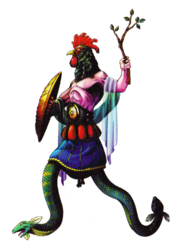 Let us remember the fact that Abraxas is a reunion of the Christian God and the devil. As I have mentioned above, in my terminology this means the union of the causal flow of life with a sudden, spontaneous interruption by the singular quantum leap, by spontaneous inner images or vegetative sensations in the body (as for example my becoming a snake or Ann Marie's union with "Mother Earth"). << [...] I'm with a close friend. I see the Devil appear suddenly. I question my friend to see if he sees this devil. He does not receive anything. Then I take a stone and I threw it on the Devil, thinking he would appear in the eyes of my friend. It falls to ashes. So without knowing why, I rush toward the sunrise, and I hear a voice speaking to me: "Hurrah, hurray, everything will finally bloom again, everything will finally become gold. Long live the God ...Axas! I see myself with my sister: we are at my grandmother, outside with her. I think, anxious, to the impending death of my grandmother. 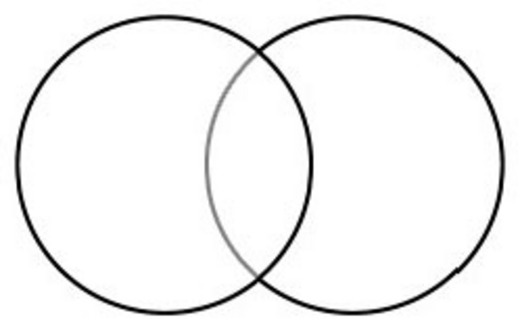 At the same time, I see two circles to form. One is my grandmother, and the other, me and my sister. The circle of my grandmother is a little higher. At first, I'm not interested in these circles that form. But that was when they intersect that I'm interested as if I found great significance to this. The two circles are completed. Completed, the circle of my grandmother means her death. - My grandmother is old but relatively in good health. - My sister = my "anima"? I initially thought the dream meant a connection between my grandmother died and I, alive. but I'm not sure of the meaning. As soon as I read your comment, "I initially thought the dream meant a connection between my grandmother died and I, alive" I had the image of wedding bands flash into my inner view. I have noticed in my material that my grandmother can be a stand-in for the World Soul - who is "on the other side". Like this you are being invited to explore Sacred Geometry and its symbolic implications for the Holy Wedding - the sacred inner marriage within you. I like Robert Lawlor's Sacred Geometry for this purpose. It seems the World Soul or what Christianity knows as the Holy Spirit becomes more active in you. P.S. Anxiety I have found to be an indication for the presence of the Self - the Eros Self in this case. But why should the looming possibility of an inner marriage cause anxiety? I like to think that the answer to that question mirrors what unfolds in an outer marriage for it can be filled with conflict. It's what happens when the opposites of Water & Fire come together. It's an anxious moment for much energy (LIGHT) can be released as in the process of nuclear fusion. Very interesting, I did not think of this idea. In a second recent dream, I dreamed that I read a book: two pages of the book deals with solving a complex mathematical equation about the World Soul. If I remember correctly, but I'm not sure, these two pages wanted to show what was the number associated with the World Soul. It was said that everyone thinks it is "8", then I tell myself it must be "9". The result of the equation seems to be "18/4". Of course, I understand nothing to this dream. Your sacred geometry dream (if I can call it that) made me think of this video I watched recently. The video may seem almost childish in its presentation, but the information in here (I thought) was good. Thanks for your help, Pascal , I'm not familiar with all these symbols. This morning, near my work, walking down the street, I saw before me a large truck with over two giant circles intersected each other. I think it's a synchronicity even if it seems to me that this is not the first time I see a truck with this logo. I like the logo and synchronicity. It says to me "reciprocal 'need' between creator and created" - which makes 'light'. There is a video clip that I like and I wonder what significance the geometric figures in this clip may have : constellation of the diamond body? "people chose to reincarnate in my body." There may be a connection with this topic. Or not.